It's been too long since I've shared adorable baby squirrel pics with y'all. If you follow me on Instagram (or if we're Facebook friends), you've probably seen these already. Sorry for the repeats, but they're so cute, I doubt you'll mind seeing them again. 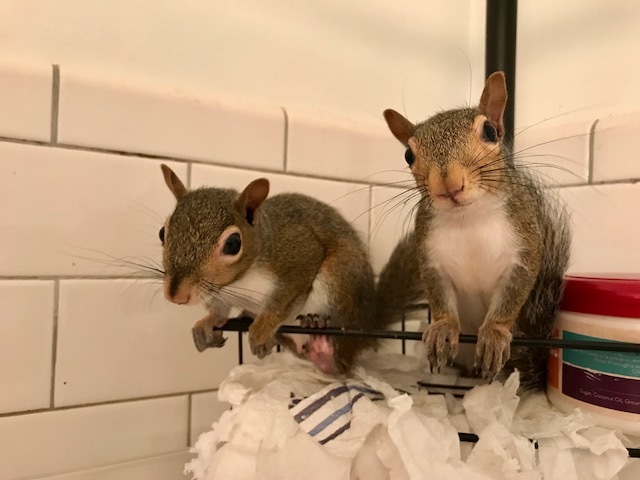 To catch everyone up, Paul and I have spent the past 12 weeks raising baby squirrels who fell from their nest in my backyard tree. This is our fourth year raising baby squirrels. We don't know how this keeps happening. But it does! So thanks Universe for tossing squirrels our way. Anyway, we raised two this year — Kevin and Kathy — in the master bathroom (mostly because it's the room that's easiest to clean). They were bottle-fed since their eyes were still closed. But now they're 12 weeks old and ready for release. So on Sunday, we opened the bathroom window, which overlooks our backyard. Kevin isn't so sure about the outdoors. Four days after release day, this is still about as far as he's gotten. Kathy, however, immediately ran down the board we propped against the house as a bridge. And then she went straight up the backyard tree! I expect Kevin will get braver with time. 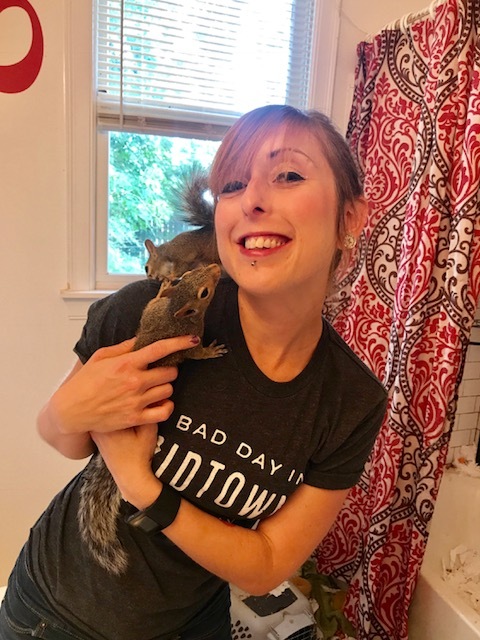 It typically takes baby squirrels a week or so before they feel comfortable staying outside for more than a couple hours. Kathy has been playing outside during the day, while Kevin stays in. But she's always back inside by nightfall. This is me and Kevin, looking for Kathy in the backyard. Where are you, Kathy??? They're still sleeping in the nest they made from toilet paper — in my shower. Kathy is clearly the alpha squirrel! Today, I came home to find this happening (that's Kathy by the way)! Uh oh! We've had squirrels take their time moving out, but we've never had one bring the outdoors inside! This doesn't bode well for me getting my bathroom back any time soon. I am dying from the cuteness!!! They just love you guys so much!! I love this so much! It's like they adopted you guys as their family instead of the other way around ;) So adorable! I know they must be a lot of work, but I bet it's totally worth it. They're so lucky they ended up in YOUR yard!